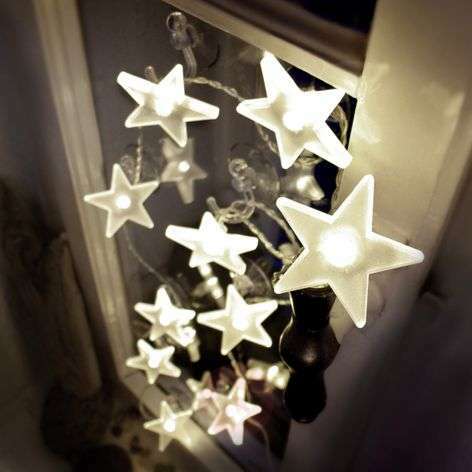 These ten-bulb LED string lights with transparent stars spread a radiant light in any room. They can be used to realise a number of decorative ideas in the Advent and Christmas season. Draped over a windowsill, a shelf or a panel of glass, a festive image is produced everywhere. The distance between the sockets is 15 cm and the length of the power cable is 65 cm. The battery box comes with a switch and is just as transparent as the cable. Ten suction hooks are also provided. Battery-powered: 3 x AA. Batteries are not included and can be ordered as accessories.